The deep-sea zone, beginning at a depth of 650 feet and plunging to 36,000 feet, contains some of the world’s most elusive, unique marine animals. The majority of these creatures inhabit the mesopelagic zone (which receives faint sunlight incapable of producing photosynthesis), the bathypelagic zone (between 3,000 and 13,000 feet deep) and the abyssopelagic zone (up to 19,000 feet deep). The deepest waters of the hadopelagic zone remain vastly unexplored. Discovered in 1976, the megamouth shark (Megachasma pelagios) is one of the rarest fish in the world. Weighing on average 1,700 pounds, and measuring around 16 feet long, the megamouth is known for its large, barrel-shaped mouth. As a filter feeder, a megamouth uses his gigantic mouth to draw in water, filtering it for food such as crustaceans and shrimp. A megamouth shark spends his day migrating vertically, swimming at depths of 650 feet during the day (though diving lower if threatened) and ascending 50 feet from the water’s surface at night to hunt krill. Rarely seen, they make most of their appearances in the Pacific Ocean near Japan, the Philippines and New Guinea. Vampire squid (Vampyroteuthis infernalis) are cephalopods that inhabit oceanic depths between 2,000 and 4,000 feet. They have reddish-brown skin and large, saucer-shaped blue eyes. Unlike most squids, vampire squids lack defensive ink sacs. Instead, these squid expand their arms and web in a defensive posture and use the photophores (light emitting-organs) on the tip of their arms and fins to confuse predators while they make a quick escape. 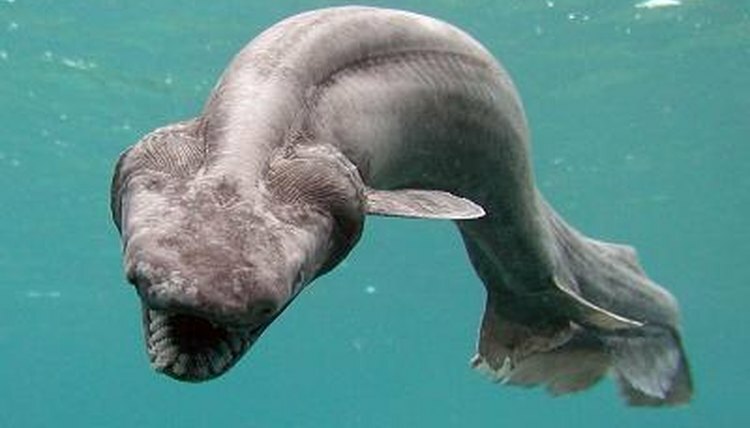 Frilled sharks (Chlamydoselachus anguineus) are found at depths between 300 and 4,500 feet. Though this species’ range is worldwide, from Australia, Japan, the United Kingdom and the California coast, sightings are relatively rare. Frilled sharks get their name from their characteristic six gills, which are surrounded by “frills” of skin. These slow-moving, solitary sharks feed on small deep-water fish, squid and carrion, which floats down from the ocean’s surface. The fangtooth fish (Anoplogaster cornuta) has a face nightmares are made of. Fangtooth fish have long, pointed teeth constantly on display inside their oval mouths. They have the largest teeth relative to their size of any marine species. Fangtooth fish are carnivores, using their sharp teeth to feed on crustaceans, fish and shrimp. This species can patrol ocean depths of up to 16,000 feet, though it’s most commonly found at depths between 1,500 and 6,500 feet. Scientific American: What Is a Megamouth Shark? Is It Still a Scientific Mystery?